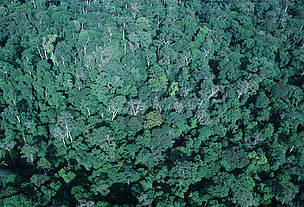 Forestry is of prime importance for WWF. Sustainable forest management can provide economic opportunities (particularly for rural populations), maintain forest ecosystems, and protect wildlife. Four companies committing to GFTN and Forest Stewardship Council (FSC) certification. At an international scale, WWF promotes the voluntary FSC certification system, especially through the GFTN. In Gabon, only three companies are certified; few other companies apply low impact logging standards. WWF Gabon is working with the International Tropical Timber Organization (ITTO), the Omar Bongo University, and the Ministry of Forests on a process of sustainable forestry audits, based on the principles and criteria of the African Timber Organization (ATO). As a first step, eight companies were audited. The government forestry administration has announced its intention to extend this audit process to all the forest concessions in the country. We have also studied the links between the principles and criteria of the ATO and ITTO and those of the FSC. This will provide a roadmap for audited companies interested in becoming FSC certified. 3. Supporting logging companies with wildlife management and recognizing traditional land-use rights. WWF Gabon works with logging companies and the Ministry of Forests to develop effective wildlife management plans for forest concessions. Two FSC-certified companies, Rougier Gabon and Compagnie des Bois du Gabon (CBG), have improved wildlife management in their concessions as a result. We aim to build on these experiences to produce general guidance on wildlife management at a national level. WWF Gabon has also carried out wildlife and socio-economic inventories as part of the Small Logging Permits Project. These inventories form a baseline for monitoring the impact of logging over time. 4. Developing tools for community-based forest management. WWF Gabon, in collaboration with the Belgian organization Nature Plus and the Gembloux Agro-Biotech University, implemented the concept of community forestry. This initiative recognizes traditional land-use practices while promoting local development. Three community forests have so far been recognized. Know more about DACEFI, the programme on community forestry. 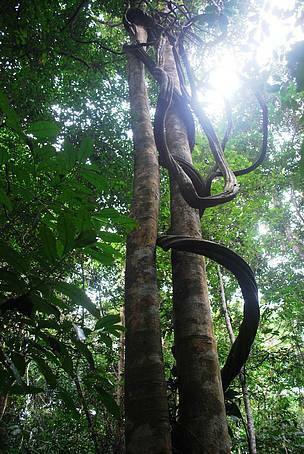 Tropical Rainforest, western Congo Basin,Gabon.